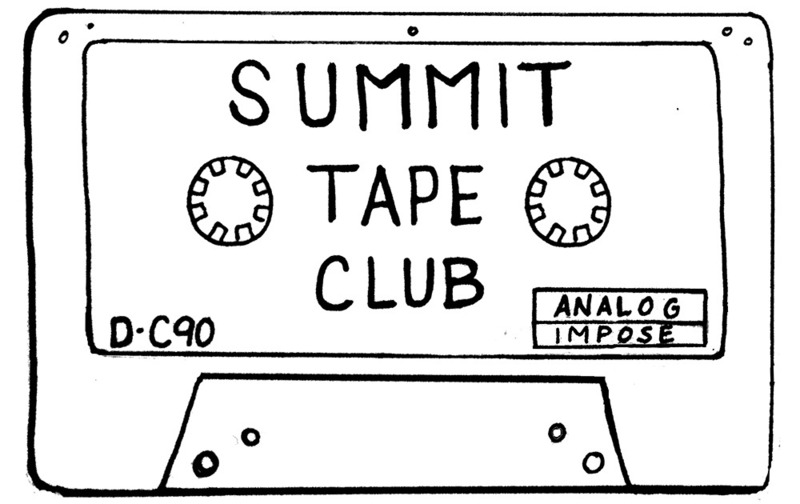 Summit Tape Club logo by Allyson Little. All photos by Eric Gonzalez. I moved to Seattle three years ago from Baltimore where I had a local music blog and a record label. Those things remain on the other side of the country. When I came to Seattle I needed to begin experiencing music in new ways, and this I am very grateful for. I’d like to think I now have a more common musical intake process, though I still spend way too many hours at record shops and I still receive demos from friends that make the most beautiful sounds. This I am also very thankful for. While I might hear a new album streaming on NPR or hear a song for the first time at a sweaty, smelly bar somewhere, I also hear new things in places where I did not go to seek them out. Enter, coffee shops. Seattle is full of them. They all play music, but their music libraries are not all equal. I was drawn to Analog Coffee within the first year I moved here for a reason. It’s a beautiful shop in Capitol Hill that plays nothing but vinyl and cassettes. It was love at first sight. I brought in some cassettes and vinyl from the label I started, and the owners became fans of Moss of Aura and more—our love grew. To go into my neighborhood coffee shop and grab a cold-brewed iced coffee on tap and hear Wading emanating through the airwaves over 3,000 miles from where that LP and I originated from was truly a transcending experience. I still miss Baltimore a lot, but I never felt more at home here than that. The feeling I had then is now the core of Summit Tape Club. Welcome to Summit Tape Club. This is not Boy Scouts. This isn’t a place to share the most rare bird you saw last week. Nope. This isn’t a standard club. You don’t actually have to join to enjoy it, and residents of Seattle might even participate involuntarily, where a small community’s cooperative listening experience is shared with the world. Summit Tape Club will operate within Analog, but will be an occurrence that can be shared with you right here via Impose. It will entail bi-weekly “meetings”, where myself and an artist or other music-minded soul will collaborate to present a mixtape and a favorite new album amongst other things. These will be played on the coffee shop’s tape deck, and also presented right here. At the core of the meetings will be a community-sourced review. We’ll gather thoughts, visuals and vibes of the shop’s patrons and meeting attendees while the cassette emanates from the speakers, and will document a true communal effort to provide insight on the album. Instead of just a writer on their laptop with headphones on at a Starbucks giving their sole perspective, this will be inspired by an entire neighborhood and will be shared via Impose. We’ll also provide a more globally-digestible version of the mixtape here, and in the future hope to expand to other mediums. The possibilities are truly inspiring, and I am excited to help share these meetings with the world in ways we can all dive deep into. This is something that could not exist in any other space. Analog Coffee started as a scheme hatched by Tim Hayden and Danny Hanlon while working together at a Seattle coffee shop. They bonded over interests in making the best coffee possible and also exploring music. Their initial idea behind Analog Coffee was to create the ideal coffee jobs, and through that building the perfect coffee shop. Music played a central role in their day to day, so music had to be a big part of the shop. Tim and Danny both love vintage audio equipment and find that their listening experience is better when they play a direct role in choosing and playing music at the shop. Watching a tape turn or a record spin is a magical way to absorb music, and has been since they were kids. A mixtape will always trump a playlist at Analog, and one in the same for Summit Tape Club. We look forward to all of you gathering around.